“This adventure comes from an idea of Giorgio Bastianelli, creative talent and artist, in his workshop in Tavullia, Pesaro. His great passion and love for art, his knowledge and experience in working with wood, together with an innate ability in seeing the product before it even takes shape, all these aspects distinguish Giorgio Bastianelli’s creations. The stiffness of wood is replaced by softness and grace; the idea is that of an accessory that can be shown like feminine appeal. The first step is the possibility of sewing the wood, then comes the study of the first shapes, the match with leather, the research of metallic elements, the use of fine wood, shades and colours. Giorgio’s determination has transformed this idea into something real, and this is how the brand GIO’ BASTIAN was created. An excellent 100% Made in Italy product. 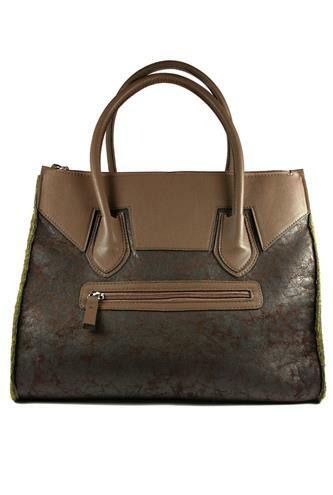 Gio Bastian bag Lara style made of wood patchwork and leather details, button closure. Interior zip pocket and two mobile phone pockets. Adjustable shoulder belt. Completely handmade by craftsman in Italy. Please note that each type of shade and color graduation are wanted particular characteristics and benefits of genuine hadcraft and in no case defects of the material or reason for complaint.